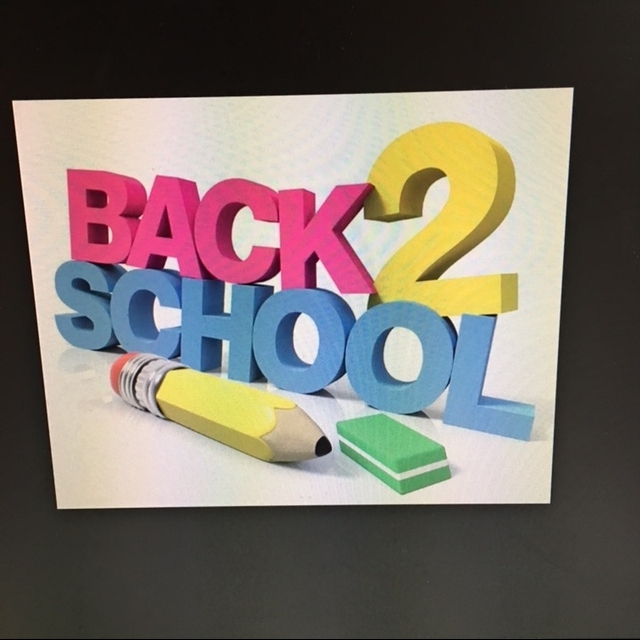 Being a former educator, I thought that I would share a little light that many parents of school age children, as well as the general public, are just not aware of. It is what I am going to call the 'Believe It Or Nots' of education. This blog is going to focus on Parent/Teacher Conferences, which will be coming up soon. There are many events that happen in a school, public or private, that could fit in this category. Just understand that common sense is not a flower that grows in everyone's garden. Luckily, there are more caring and thoughtful parents out there who understand how hard most teachers work. It is not a job for the faint of heart. Then add to the stress of school district mandates, common core, No Child Left Behind, testing and more testing, salaries based on test scores, constant evaluations...now add in unreasonable requests and comments from parents. Although many times it easily explains the behavior of their children. Sad but true in most cases. The apples do not fall far from the tree. Let me give you some specific statements that have been made to me or a few teachers that I know well - well enough to tell you that there is no way anyone can make this stuff up! He doesn't do this at home. The only reason he misbehaves is because you don't like him. Could a teacher come out to collect my child from the car each morning? Please do not call me about my child's behavior. She is with you. Word to the wise, "He bites!" Roald Dahl and Harry Potter books? Those are all devil books and there is no way my child is reading them. I don't believe in sending school supplies. It looks as if you have plenty. You clearly do not see just how gifted our child is, otherwise you would never have given him a C.
It is very important to our child that you acknowledge her imaginary friend by calling her name at roll time and giving her a seat. I know that my child has a fever. It is just an allergy. I am away on a business trip the night of the school play. Can you please reschedule it? My daughter needs an older teacher. I don't think it is appropriate for you to dye your hair. This history is from so long ago. When do you think you will get to the history of now? It is not very encouraging of her ideas for you to make her raise her hand before speaking. These are things that just boggle your mind. It leaves one speechless and then somehow a plan comes to mind about what you will say in some kind of a form of diplomacy. Most teachers find a way. Of course, then there are some who need to cultivate their common sense gardens, along with some of the parents. These are the cases that go to the administrative staff and now we are on a different playing field of handling a problem that never should have been one in the first place. When I share some of the nonsense that teachers and schools are requested to do by parents, it really does seem to shock many. So many educators say often that it is not the kids that are the problems, it is some of their parents. Just know that when you go in to meet with your child's teacher, think of something good that he or she did for your child and tell that teacher. It is all about the little things that help a teacher hang on to the day to day work of teaching in a time and era where is seems that teachers are not paid or respected in a way that they should be. What happened to the days of when a parent told their child that if they got in trouble at school, then they would be in double trouble at home? We need to get back to respecting education and letting our teachers know that we are totally behind them. Children learn easily how to mimic their parents. In the words of Graham Nash, "Teach your children well." It is quite exciting to me when I get an idea in my head and set out with a list of how I plan on accomplishing this. The plan that I am working on now is getting into shape. Truly it is something uppermost in my mind after having a brief health set back in May. Both sides of my brain are talking to each other on how to manage this feat in the least possible painful way. Note to self: this plan has to become second nature through daily practice. No excuses allowed. Let me begin with the fact that in order to work out, I feel like I need the right outfits and equipment. Nothing super fancy; just a really good pair of sneakers and workout gear that I feel comfortable in. In past attempts, I have tried going to the gym. To me, it makes me feel a little self-conscious, in that there are so many in the gym who look as if they don't need to even be there. Now, the intelligent part of me says, "Yes, they look that way because they go faithfully and it is a part of their life." On the other hand, many of them have never had a problem with diet and exercise and for the most part can eat anything they want. Aha! That takes us back to the statement above citing that they look like they don't need to be working out. It is a vicious circle. They can eat almost anything they wish because they work out. There is a reason that I feel so strongly about running. One is that two of my doctors told me that this was so bad for a person's joints. And in fact, they both said that if you walk quickly, you will get to the same place, just not quite as fast. Then, I started to take notice of people walking and jogging in the neighborhood. Those walking had a much more pleasant look on their faces. The joggers looked to be in pain. Well, there you go...that explains the saying of no pain, no gain. Except, I don't buy into that theory. One can become fit without going into pain. Yes, you might become a little sore or achy from moving a few muscles that have not been moved in a while. Still, a big difference in the level of pain and the long term effect to your joints. To me, I do know that getting physical and being active is important in so many ways that we all read and hear about in the media. Both physically and mentally this helps us all become healthier, we sleep better and we function with a clearer outlook on life. Never would I judge another person for choosing to be a runner. If it works for them, that is all that counts. It just does not work for me. Now let's move to the other side of this getting physical. I can get physical with exercise, such as walking, biking and just plain moving my body more. Let's now focus on the side of what you put into your body for fuel. Reading and learning more about what is healthy and what is not is like trying to sort out hierglyphics. One day eggs are not so healthy for you and the next day they are excellent for you. You should not drink alcohol, then it is published that red wine has so many benefits, as does chocolate. Red meat? Fish? Vegetarian? And the beat goes on. Who do you believe? For me, I find that the best way to keep your sanity, as well as to keep true to becoming healthier, is to keep the philosophy of moderation. Everything that I have read regarding moderation makes just good, common sense. If you tell your body and mind that you can't have something, it is human nature to crave this. So why not have portion control, using what you need to eat, in order to have the amount of protein, carbs, fats, etc. to be eating in a healthy lifestyle. Have a reward day so that if you want to share a dessert with a friend, you can do so without guilt. The apps that our smart phones have and that also go along with Step Counters that we can wear on our wrists can help keep us on track. Information is out there for us to read and try to stay true to our plan in the happiest way possible. Notice that I did not say easiest way...there is no 'easy' way, really. It has to become a part of you and your lifestyle. This is as simple of a solution that I have found. It is a way that will surely make you happy, knowing that you are taking care of you. Now, off to do a bit of walking, indoor on the treadmill though. Heat advisories tend to keep me inside for exercise. Have fun and let's get physical! Life is just a bowl of cherries. That is what they say. So for us all to be able to think of frustrating situations with amusement is a much more positive way to get us to that bowl of cherries. 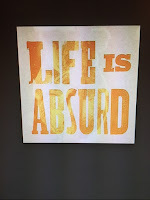 For me, today was one absurd moment after another. It all started at 5:30, which is the usual hour that the neighbor's gigantic dog is let out, watches a leaf blow by and gears up for a barking fit. It would not be so bad if it were not for the fact that their iron fence is approximately 12 feet away from our bedroom window. In my own mind, I think that the iron helps to make the bark deeper and louder! For the most part, he is hurdled back inside again quickly. This only happened after we asked our neighbors to please not let him bark outside our window so early in the morning. This apparently was not the neighborly thing to do, so now our name is mud for being so absurd. Now it is up to me to choose to be so upset that I can't get back to sleep or to let it go. Being a dog lover, I know dogs will bark. It is not the fault of the dog. It is the inconsiderate owners, who have not taken responsibility for training their dog. My choice is to let it go and fall back into my dreams. The next part of my day was spent getting dressed, having breakfast and answering e mails. One of which was extremely important and required searching for papers and making calls, in order to settle what I thought was already settled. I had to ask for specific directions of what this company needed from me. When I made that request, I absurdly spelled out and repeated what he said each time to be sure that I got it right. Once that was completed, a wonderful friend called to say that he was on his way over to check on our ceiling fan; had it died or did he need to put in a new one? He did volunteer for the job and we had it planned from the beginning to pay him for his generosity, however, bless his heart, it turned out to be a two and a half hour job. Patrick is not even an electrician, but was doing this on his day off. Of course, I stayed with him to help him get what he needed for the work he was doing so that he was not going up and down on the ladder. During the time that he was here, both my daughter and husband called. I let them know that he was still here working away and that I needed to get back to help him. Finally, when Patrick, did finish a beautiful, yet very frustrating job of checking the old fan to be sure it was dead (it was) and then installing the new one, I fixed a quick bite to eat and got busy working on my Friday blog page. I do have lots of topics to start with, however, it was as if writer's block had taken over. Oh no! What to do? It did make me slow down, take a brief meditation and just breathe in and breathe out. It will all be okay. After all, two very famous writers came to my mind who claimed that they had writer's block. One was Rod Stewart. He found at a certain time in his career, he could not get one song out on to paper from his brain. It was rather interesting how he solved his problem about song writing. He wrote an autobiography, true to himself, without sugar coating his life. When he had finished the book, songs finally started popping up in his brain. He had enough going on to record a new successful CD. Then there was Charles Dickens who claimed any time that he found himself not able to write, that he went for long walks around London to use his observation skills which always gave him ideas for writing. Since it was pouring down rain here, I really did not have the time to take off to a mall and walk to find some events to write about, when it dawned on me to write about the absurdity of this day. We all have days like this. How we choose to respond is what the bottom line is. Using humor as medicine tends to relieve stress and improve your mood, as well as to put things in perspective is a smart thing to do. Writer's block and any other frustration can just be pushed aside when looking at the laughable moments of our days. If I had gone the other route to allow frustration and irritation to take over by being annoyed with what did not take place when I thought it should have, then nary a thing would have been accomplished. Looking for the humor in whatever it is that is threatening to rile me up is much more fun. Humor is most definitely for people who want to have fun, enjoy life and feel alive. 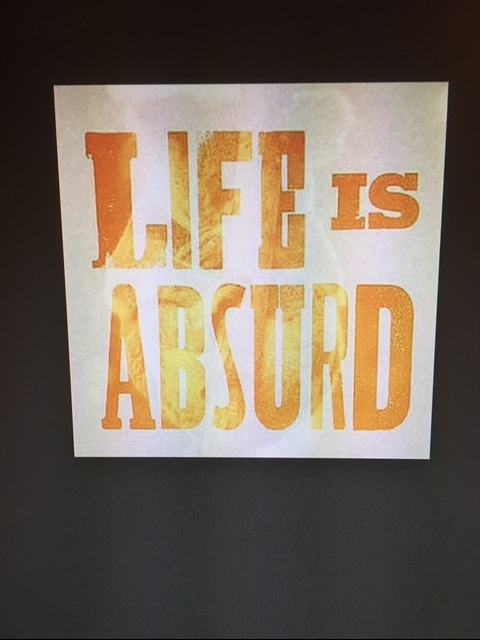 Absurdity is out there in our world, so we may as well have fun with it. Just so that my readers know,when I am writing my blogs I am talking to myself, as well as to anyone else who may be interested in what I have to say. 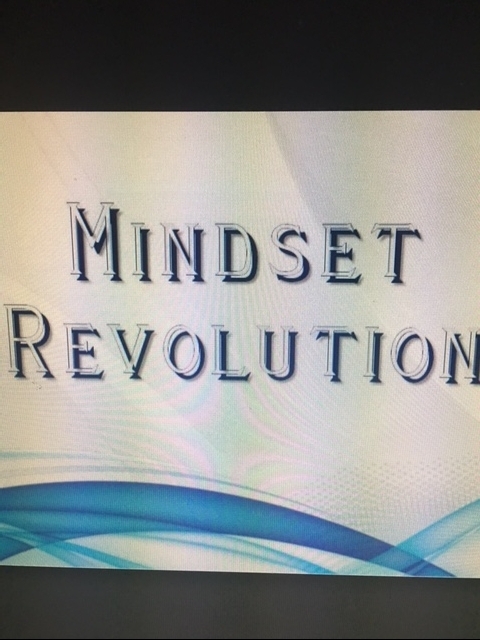 In other words, I am not on a bandstand preaching, rather I am stating what I know works for me to help me continue on in retraining my own brain to think in different healthy ways. Just the other day, I came to the realization of just how much that I was totally stressed out in my former job. I worked very hard to try not to be. Please don't get me wrong, as there were some good things about it, however, I had to hold so many things inside of me, that I did not realize what it had done to me mentally and physically. I practiced most all of what I am writing about here and had my ultra supportive husband 100% of the time, but I did not realize that after my retirement it has taken me almost 8 months to get to where I am today, which is much less stressed. How do I know that I have come down to a less stressful lifestyle now? 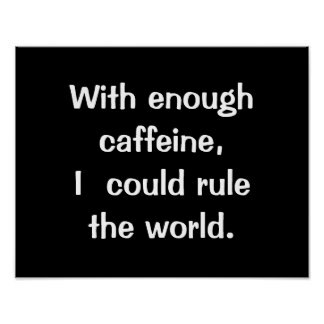 One way that I discovered is that instead of a pot of very strong coffee, I am down to two cups of coffee a day and the strength of the brew has lessened considerably. I still love my coffee; just less of it is needed to get me through the day. My neck and shoulders do not feel tight and tense any more. There are ways to measure stress. It is important to be aware of them. With that being said, it is important to identify your stress triggers so that you can work on managing your stress. We all know that it would be impossible to remove all of the stress from our lives, but just understanding the way certain events or people can cause stress will help us know the way to deal with them. It is all about finding a balance. When I talked about how I was feeling with my doctor a few years ago, he shared with me about the value of a good massage therapist. He even gave me the name and number of the one he uses. Truthfully, at first, I was a little skeptical. For real? Then he cited all of the studies that have been conducted about how massage therapy not only feels good, but what it does for your body and mind when in the hands of someone who knows what they are doing. The body has amazing powers over the mind. Another area to look at to help in de-stressing is through the power of music. Music therapy is used in so many different ways because it has a special link to our emotions. Usually it is the slower, classical music that has such a wonderfully relaxing effect on our bodies, such as slowing the pulse and heart rates, lowering blood pressure, which is decreasing the stress hormones. Music can be added so very easily to our lives, such as when you are driving having your CD's or Ipod in the car with you can help calm you when in rush hour traffic or dealing with aggressive drivers all around you. I do highly suggest NOT to listen to the radio if they play a song and then have 10 minutes of commercials, especially when it is the insane yelling from some car dealership. (I found this only added to my stress levels.) Music can restore harmony between body and mind. Find a quiet time for you. Giving yourself just a ten minute time- out will help quiet and calm the stresses floating all around you. It helps to put up a guard. You can do this through meditation, of which I am a strong advocate for. Calming and getting your body still and quiet helps to work on doing the same for the brain. It does take some training to help your brain calm, sometimes having a quiet personal and positive mantra inside your brain or even saying it out loud helps. Writing your positive mantra and focusing on gratitudes in the written form of your journal has been proven to be beneficial. This is also the place and time where you can set up specific plans of a mini or major vacation to plan that will help to cushion your calendar of "must-dos." Seeing this in writing will make you smile just to think about what there is to look forward to. Smiling also is a known way to help rid yourself of stress build up. We all know that the most talked about de-stressers are to eat well, get enough sleep, and exercise. Yes, these are all things that we need to do in order to maintain our health. There are a few other things that many people just do not think about that may be of tremendous help. First, you must think about what makes you happy. You are worth whatever it takes to create your own happiness. For me, it is flowers. The flowers that are all around our garden, thanks to Steve, my husband and our gardener with the green thumb, makes our back and front garden a haven to be around. More than that even, he saw how I react with flowers around me and this very special man makes sure that flowers are always around me. Yes, I am spoiled this way and no, he is not for hire. Not to mention the fact that you can also kiss away stress. Remember when you were little and got a boo-boo? Your momma always said, " Let me kiss it and make it all better." Momma was right! It helps me to remember a quote from Ralph Waldo Emerson that states, "Nothing can bring you peace but yourself." So with that said, let's stay busy finding the ways that will bring us peace and less stress. An old Chinese proverb goes something like this, learning is a treasure that will follow its owner everywhere. The first thing that struck me is that it does not state specifically what kind of learning. 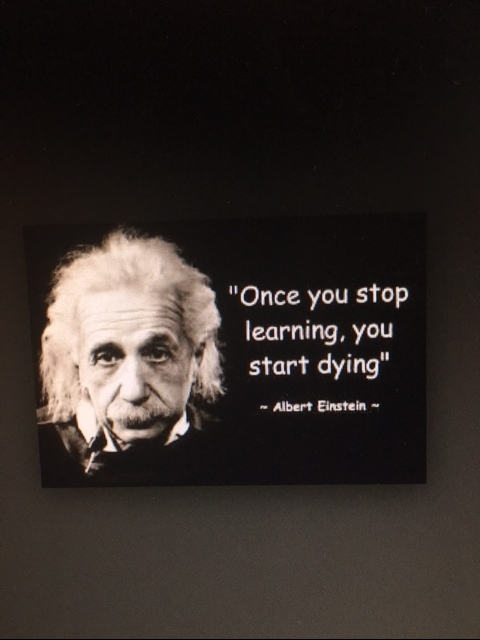 It is all about learning. Let's start with what most people instantly gravitate to when they hear the word learning: book learning, which usually is the formal education side of learning. Yes, this is important in many ways. Not so much how far along in schooling one gets, as it is that the formal education that you did receive taught you how to take responsibility for your own learning. Hopefully, it gives us a base to work with creatively. To me, it is not about the formal side of learning, as it is to put yourself in the position of learning every day on your own. It can be through books that you own or borrow, or seeking out the experts in a particular field that you want to know more about, or it can be continually asking questions until you get answers that you need. Just like Einstein is quoted above, we really do stop learning when we stop asking questions and looking for answers. He was just a bit more descriptive. Formal education can help one learn the basic facts of life and can help make understanding of the world a little more clear. This can lead to helping to make better decisions as a whole. because it can help increase common sense. It really is quite different from what we learn in school and is not always guaranteed that you will acquire common sense if you have more formal education. There are debates going on continually about whether formal education does or does not impede on common sense. While in line at the grocery store there were two people behind me talking about their children. One was graduating with honors, while the other one was not, however the conversation from both adults led to the debate that probably the one with the higher formal education did not have an ounce of common sense. What does come in to play that they were forgetting about is that a formal education is very important and it usually takes common sense to do well with book learning as well as in life. If anything at all, a formal education enhances someone's abilities to use their own common sense to explore and discover. This formal education can mean from high school all the way to receiving a doctorate. The important thing is that the person had teachers and mentors along the way that showed them that education is so much more than memorizing facts, but digging down deep for developing critical thinking. The entire world of knowledge is just a computer or a smart phone click away. We need to make it part of our daily routines. I am addicted to 'googling' the instant that I want to know the answer to something. Depending on where I am, usually it can be done in a flash. Don't get me wrong, there is a definite need to be "well-read," in terms of what is going on in the world. For one thing, it makes for a more interesting person. Why not take it a step further and ask your own questions and find your answers through researching and asking more? Basically, this involves learning to let go of thoughts that do not allow your mind to move forward. Unfortunately, there are a whole lot of people out there that think learning for the sake of learning is for school children; that they do not have the time for such trivial things, as they have serious work to be done. To that, all I have to say is that this will make Jack or Jill a very dull person to be around. In my own opinion, we all need to make learning a daily part of our routine. Changing careers meant changing a way of life that I had known for a very long time. You see, I was in a school, which really is a very restricted environment. I walked in at 7:15 and did not leave the classroom or my office or the hallways, or the cafeteria until the day was done. Some days this meant staying for parent meetings, Open House, Family Math Night, or whatever else was happening at the school. Unless I was called off campus for a district meeting, I was in that building. Friends in other careers would use their lunch hour to stop off and run an errand or OMG - go out with others and have lunch in a real restaurant! When I did get a day off and met my husband or a friend for lunch, I was in awe just looking around me at people who were out and free to move around. However, I am not going to whine and moan about this. I just need to change my mindset and do something about it. 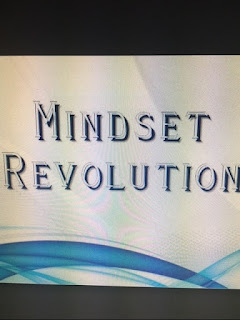 Now I have become in awe at the word mindset. As a writer, I have only me to listen to as to when my hours are, will I read, research, hand-write, type, go out to work in another environment besides my own home office, have music playing...all my decisions. For my mindset, it has to be open to listening to all ideas and choosing the ones that work for me. We all have filters on our mindsets. These are preconceived notions of how it is suppose to be or what it should look like and even how you should be thinking. To give you a visual, as soon as someone starts explaining their way of thinking that you may not agree with, you may as well just hold up a bright red STOP sign. This is based on your previous experiences you begin to censor others before you even hear their ideas through and through. I knew that I had to open up and let go of this in order to evolve. Knowing that I was ready for a change helped me know that I had to make some personal adjustments and tweek a few old habits. One positive habit that I had already started with was to begin my day with a positive mantra. Something that would stay in my head and with me throughout the day and hopefully stick somewhere in my brain so that I can pull it out whenever I may need it. I called these my milestones. I know that these will lead me step by step, stone by stone, mile by mile to where I want to go and who I want to become. impression and make way for a clearer brain. This means a form of discipline called self-awareness. Being conscious and aware can and will determine the outcome of your situation. For me, I find meditation is the way to help clear and clean my thoughts and be ready to open up to new ideas. Starting the day with just ten minutes will set you on a new path to freedom. A quote from Oprah that I read once really did stick with me. "We can't become what we need to be by remaining what we are." This quote struck a chord within me. I am moving on and becoming what I want to become and the only way that I can do this is to work on my mindset. Such a powerful word! Would you rather have your mind opened by wonder or closed off by beliefs? Truly, I embrace and cherish my Southern upbringing. We lived in the city, however, my great grandparents had a farm. A real farm with cows, chickens, goats, sheep, horses, barns, crops, and everything else that goes with owning a farm. I reckon that the horses are what made it fun to go to the country for me. My great uncle was a true horse whisperer and he loved to put me on a horse and take off for a ride out in the country. That is about as country as I can get, except for my speech. Being told as a child to hush my mouth or that there was no need to pitch a hissy fit or one of my favorites was that I was gettin too big for my britches, honey chile. In my teenage years, I knew I was in big trouble when my momma told me to sit down so that she could tell me how the cow eats the cabbage. The Southern expressions are all in my head and many times they pop out when I least expect them to. There is no way to hush my mouth, I swannie! Many expressions were used by grown-ups all around me and as a child, you just learn what they mean and when to use them in context. For grown-ups who did not swear, like my dear very Southern grandmother, she would use, "Well, I swannie," all the time. Usually when she heard or saw something unbelievable. It was because she would not say, "Well, I swear!" Swear was changed to swannie. Actually, I learned that true meaning not so long ago. Already, I know that we drop the g on the end of words such as good morning (mornin') and Darling (Darlin'). And of course, you do know everyone is Darlin' in the South. This really did seem to bother some of my Northern family who would meet my grandmother and hear her call them this, as well as when it was time for goodbyes she really, really did always say and meant it from her heart, "Y'all come back now, ya hear?" Bless her heart! It was who she was. No pretense. Speaking of Bless Her Heart, you are aware that depending on how it is said, this phrase means many different things. For a woman who showed up wearing something that she just did not have a clue about how terrible it looked or a pot luck dish that was inedible, the other women would gather in closely and say while shaking their heads, "Why bless her heart." This meant that they really need to take some pity on her for she does not know any better. Then again, if you dropped something on the floor and someone helped you by picking it up and handing it to you, then bless your heart is as sincere as a thank you! There actually is a book out that explains when and how to use this phrase. Lawdy, lawdy! Some that my grandfather would say were just too visual for me, such as after dinner when he overate, he would say that he was full as a tick on a fat dog. Or when someone was way going over the edge with excitement and anxiety then he added she is running around like a chicken with its head cut off. (By the way, when I went to the farm, I actually saw this in real life - well, not the chicken's life, that is for sure, and not a sight that I ever wish to see again). 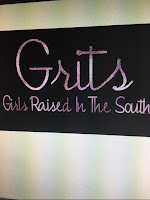 I think that I will save other Southern expressions for future blogs because I am fixin to sign off on this one. Mainly because it is lunch time and I am in need of a truly Southern lunch which is a 'mater' sandwich. Good bread, light mayo, a home-grown tomato with some pepper on it - and it is like stepping back in time. As a true southern author, Lewis Grizzard has been quoted as saying, "It's difficult to think anything but pleasant thoughts while eating a home grown tomato." 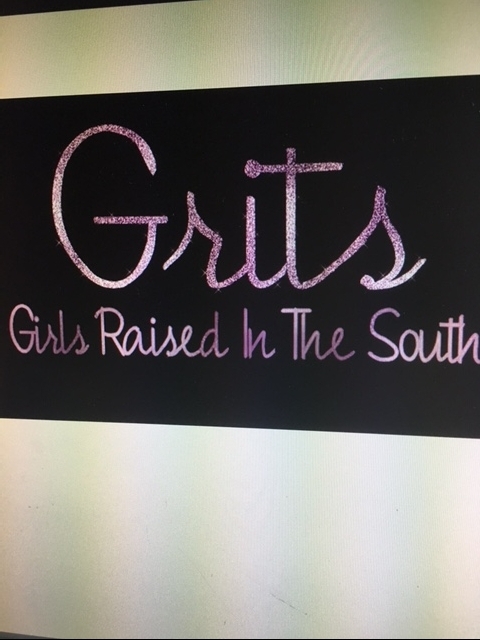 Brought to you by a Girl Raised in the South GRITS! If you had a choice of having a higher IQ versus having a higher EIQ, which would you choose? Maybe I need to back up to explain what EIQ is. I am always a little surprised that so many have not heard that term used before. Emotional Intelligence Quotient simply means the skill to identify, assess, and control emotions of oneself, of others and of groups. Don't get me wrong, it is important to at least have close to a normal range IQ. 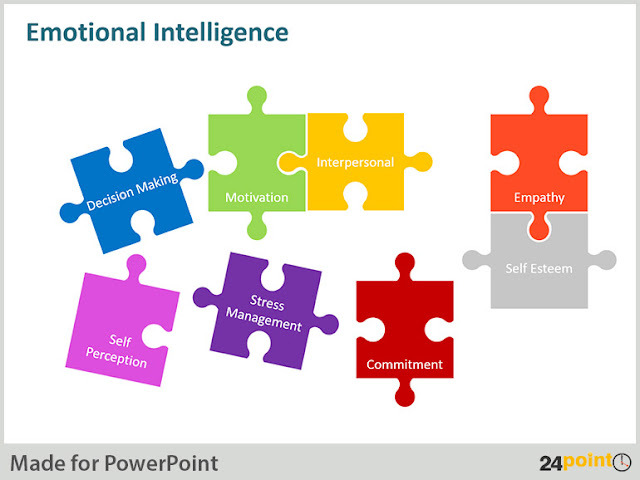 It is more important to have a higher EI. This has been proven in large corporations across the world. Those that are willing to keep a check on certain types of behavior learn quickly that it can take them far in their careers. There is still a debate on whether or not EI can be learned. I believe that up to a point, it can be. That is the optimism in me. However, I do understand that are some real "grinches" in this world. These kind of people have to be taught the old school way, if you plan on getting any where with them. So for now, let's just focus on ourselves. EI people are mindful of their feelings and the affect they have on themselves, as well as those around them. They have empathy and find it very easy to put themselves in other shoes. These people do not find it difficult to read body language and facial expressions of others, which in turn helps them understand what to say or not say to other individuals. Sometimes it is easier to blame others about the way you feel, yet this is rarely the case in a true EI person. They take full responsibility for their feelings and their responses. Sometimes this means to step out of their comfort zone, which they will do knowing that this is the only way they will grow. They are good at digging a little deeper to find out not only the cause of their emotions, but to deduce why they feel this way, and to come up with a plan of action. In their world there is never time for gossip and peer pressure. EI people carve out their own path and do not need approval from others to validate themselves. Even though they prefer to avoid conflict, they know when they must say, "No." They prefer to use their energies in a positive, respectful way. As a grandparent, a parent, and a former educator, there is something that needs to be addressed before it gets any more out of hand than it is already. This being the fact that our children who participate in activities that reward with a trophy or blue ribbon, etc. really earn it or is it given out to everyone and therefore means nothing. Somehow we got off the track of this simple idea. Recently during sporting activities that were televised, there was a commercial where a father and his son were walking from the child's game to the car and the dad looked at the trophy which up close said, "Participant." The child asked his dad if he had won. His dad got a sharpie and quickly wrote 1st place. Then he handed the trophy back to his son and said to his son that yes, he did. The dad's heart was in the right place in that he wanted his child to feel good about himself. What is wrong with this picture is that we are giving children the impression that they will win at everything they do. In the cold, cruel world, we as adults know this is not true. To quote L. R. Knost, "It is not our job to toughen our children up to face a cruel and heartless world. It is our job to raise children who will make the world a little less cruel and heartless. How do we do this? Not too very long after this commercial was televised, a very well known father was at his daughter's school track event. She too, was given a "Participant" trophy. The father walked back with her to the place where the trophies were distributed and said to her that he wanted her to give that trophy back. He explained his thinking was that of course, she participated. A trophy should be given with respect to those who won. She did not win this time. I applaud this dad. And to make this story even better, his daughter did go out and pushed harder so that in another event, she did win the trophy and felt very proud of herself. In my opinion, we have to stop giving the awards for things they did not accomplish. Let them know that it is not the end of the world if they did not come out on top. There is honor in giving it your best shot, yet someone else did just a bit better this time around. With the Olympics on TV currently, now is the perfect opportunity to teach this lesson. There are three medals given for each event. These athletes have trained for years to get to this level. Yet, all of them can't win the gold, silver or bronze medals. Only three will be rewarded in the end for each event. The other athletes gave it their all. Teach children that there is no shame, as long as you did your best. Also, teach them that there will be other opportunities to try again. Work on different strategies to try to earn that trophy. Another place that I have seen this kind of behavior is at school, especially elementary, award ceremonies for grades. Usually, this award is called the Principal's List for all A's. Now, let's be real. We all can't make straight A's. Very few can do this each and every marking period. So only a few children will be going around the school with a special pin on and get to walk across the stage for their ribbon or trophy. They should be rewarded, just as by high school there are a few students who are inducted into the Honor Society and in college, a few students who make the Dean's List. And the others? They have something to strive for and if in reality that is not possible, they can, with the help of their parents push to continue to do the best that they can. In the long run, no employer is going to check out report cards for all A's or some B's or C's thrown in here and there. What they are going to look for is someone who will give it their all in whatever task they are working on for the company. 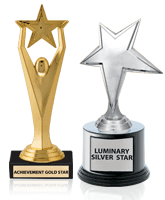 The fact that so many parents want little Johnny or Suzie to come home with something more than a participant award, even when it was not earned is setting up their own child for a cold and cruel world when they get to the workplace. Instead, let's show them that we all have our strengths and by working together we can make the world a little less cruel and heartless. Teamwork! 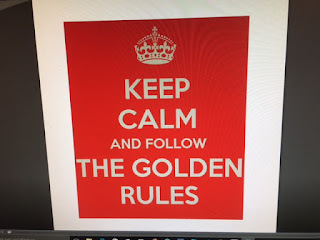 Do We Really Need Rules? Let go of your need to control. Being able to control may make you believe that you are more secure. It can drive others away and therefore have a tendency that will hinder you from actually achieving your goals. Basically, this means to share. Live in the moment. The only constant in life is change so living in what is happening in front of you now and doing your best will give you no worry about the future nor sadness of the past. Just be happy with what is NOW. Avoid overthinking. Take things as they come and listen to your intuition. It is stronger than you believe. Trust yourself. Be comfortable in your own skin. No one is perfect. Love yourself for who you are. Be proud and walk tall. Appreciate and be grateful for what you have. There should be no comparing what you have to what others have - the saying of the grass being greener on the other side? Hogwash! Take care of what you have by nurturing it and you shall have the green grass too. You may not want the whole story that comes along with that green grass that you think is more green than yours. Look for the positive in each situation. Another way to say this is to try to make lemonade out of the lemons that you believe were given to you. Move on and start anew. Let go of your ego by being true to yourself. This means not to try to live in an illusion or that illusion will burst before your very eyes. Definitely an unhappy sight. Keep an open mind. Closing off others due to your beliefs vs their beliefs is a sure fire way to get stuck in a rut. You do not need to buy into everything new that comes along, however, you do need to be willing to at least listen and be decisive about your beliefs. The more information that you take in, the better informed your decisions will become. Silence sometimes is better than being right. It is rather like the person who has to have the last word. Why? What do you gain? Slow down and say thank you and please. Smile and take deep breaths along the way. This will help you to take the time to do what makes your soul happy. Life isn't fair - get used to it. If you think your teacher is tough - wait till you get a boss. Be nice to nerds. Chances are you will end up working for one. Bill Gates believes in keeping it short and simple. Robert Fulghum, author of All I Really Need To Know I Learned in Kindergarten kept it simple also. He just went into a little more detail about life's rules. There will be times when a rule gets forgotten and you may have to go back and review your strategies in order to move ahead. That is okay. Remember, that we are not perfect. Things happen. How you respond is the important part, as well as if you learned anything by the experience. At the end of the day, the only questions that I want going through my hard to turn off mind, especially when it is time for sleep, are important questions. Some of these include: Did I love enough? Did I laugh enough? Did I make a difference? To make a difference in someone's life, you don't have to be beautiful, brilliant, rich or perfect. You just have to care. Caring comes from the heart and can't be manufactured. A person either has this empathy within themselves or they don't. That is not to say that I believe that a person would be able to change to a degree if they tried very hard. One must be willing to stop the 'all about me me me' syndrome and move on to listen and understand what another person is going through. To care means that in some way you are demonstrating your ability to listen and understand what they may be going through. There will be times that it is something that you may not have gone through yourself, personally, however you are able to listen and understand that it has to be hard. We need to be willing to take a chance to be someone else's supporter because sometimes some things only happen once. And there you are; missing the boat! It will weigh on your heart if you miss opportunities. All it takes is to try to help someone look for the rainbows when it is raining and when it is dark outside, help them find the stars to light their way. It is an uplifting moment for both of you. Perhaps you may think that your light is small, but it can make a big difference in other people's lives so why not let it shine. Sometimes just a little compliment can make someone's entire day. As a perfect example, I am going to share what happened to me this past weekend. A very dear neighbor and friend stopped by with a bouquet of flowers, a card and a helium balloon. Just for me. Knowing that I had been going through some difficult health issues and for several reasons, this past weekend had been very tough. She came over to let me know that she was thinking of me. She most definitely has her own issues, as we all do. She took the time to think about me. How special is that? There have been times in the past that I have been there for her. She needed to water exercise and was being driven across the way to make this happen. We have a pool and live across the street. COME ON OVER. That was just a no brainer. And when I could get off work, I could join her. That is what friends are for. Never expecting anything in return. I just wanted to offer to her whatever I could in order to help her through what she was experiencing. One thing that I do for me, just to try to help my psyche feel better, is to get dressed nicely. It helps me to put a perspective in my day when I am not feeling like myself. This dear friend noticed and continued to tell me how good I was looking. I can tell you that the whole package of her walking over, handing me the bouquet and hugging me, talking for a bit and giving me a compliment very much so made my day. As Dr. Suess said, "Sometimes you will never know the value of a moment, until it becomes a memory." Sweet memories hopefully...and believe this will remain in my mind as a very sweet memory. My Southern upbringing taught me to always acknowledge kindness. That very evening, I took the time to write a heart felt thank you note to a very dear friend. Do good for others as it will always come back in unexpected ways. You will be able to answer yes to those questions. Yes, you loved enough, laughed enough and made a difference. The best thing about being my age is that I do not tell my age. Why would I? To me, that is very private territory. Some people like to shout their ages from the rooftops. Almost, as if it were something to be proud of. And in one way, it is better than the alternative! My question is why should it matter. It is just a number. How you live is much more important. At my age, I don't feel the need to compete with others and with that I have an inner sense of peace and freedom. I am in competition with only myself. To set one's own goals and to reach them and then to set new ones is uplifting. I still go by a method called SMART goals, which for those who are not sure what I mean: S = specific, M = measurable, A = attainable, R = relevant, and T = time-bound. That may be very old school but it still works for me and keeps me on track. There are still problems to solve, plenty of them. Now, they are much more manageable and on my time. It is such a wonderful relief to relax and enjoy life versus just one year ago, when I was solving so many problems brought to me in my job that I actually started to make tally marks of just how many I did take care of within the first hour of work. Most people could not believe my typical day. Every day is about having experiences and being aware of what challenges are being placed before you. Being aware will be what determines the outcome. Luckily, for me, I had support from my husband who knew exactly how to bring me down from my work day stress. What I did do for myself was start using meditation and positive mantras at work. I even put out a weekly MILESTONE to my co-workers with a positive mantra to help others if they wanted to read it. They were short little positive motivational quotes that I later learned many had placed around their desks, posted on walls, and shared with others. This really did validate what I tried to share with others, while at the same time helping myself remain sane. Being my age (whatever that may be) is a very good thing. One of my favorite words is serendipity. In my case, finding something good without even looking was like finding gold for me. I had no idea that a whole new world was out there just waiting for me to feel it, see it, hear it, taste it and experience it. That is called learning in the real sense. My age is very special to me. How many times have we heard the old saying about the grass is always greener on the other side? My answer to this question is depends on what you are looking for. Many problems can and will pop up when we buy into this myth. Ugly characteristics begin to appear such as jealousy and asking yourself why do other people have all the 'good stuff' which leaves you feeling depressed about how little you apparently have. Your life can be taken over by wanting more and more and more. Is that what you are looking for? This is where it gets tricky. In reality we are all less than perfect and the shiny, green grass is an illusion. So let's imagine that you made that step to the other side of the fence to be on what you believe to be the greener grass. Once you have set foot on that shiny, green grass, it will never be exactly the same again. What happens is you start off in "the honeymoon period" where you think it is better, however, as time marches on, you discover there are other issues that you were not aware of and you may find yourself wanting back on your old turf. At least there you were aware of your issues. You realized that you traded one set of issues for a new set, which may not be what you thought you wanted in the first place. Maybe the cliche should be: "The grass is only as green as we keep it." Just as the picture above says: The grass is greener where you water it. There has to be nurturing and love of yourself and what you have. A quote from Buddha states that the way to happiness is actually quite simple; the secret is to learn to want what you have and not want what you don't have. Thinking positively isn't about expecting the best to happen every time, but accepting that whatever happens is the best for this moment. Actually, if we all stop focusing on what we don't have, which just stresses us to our limits and remember just how blessed we are, we will be able to keep our grass green by committing to taking care of it. If you want greener grass, learn how to water it. The song, Everybody Wants To Rule the World makes more sense to me when I hear it in the point of view from a powerful person's subconscious justifying their actions. Just thinking about what all is going on in our world today, it made me think about things that we should all be doing in order for us all to be able to come together and unite so that we have a more peaceful world. The quote from RUMI, "Yesterday I was clever so I wanted to change the world. Today I am wise, so I am changing myself," is how we should all be thinking. There are a multitude of things that we need to just quit doing. If we keep doing things the same way then we will continue to get the same results. However, in my mind this is a negative way to look at it and if you know me or of me, then you know that I am always looking for the positive spin on everything. So that is how I will be writing this blog. Instead of we need to stop doing this, let's focus on what it is that we do need to be doing. Let's begin with doing what pleases you. You have heard the expression that you will never be able to please everyone and if you think that you can, good luck to you. If we work on doing what makes us happy by not putting ourselves down and overthinking events that have not even occurred as of yet, problems have more of a chance of coming to a solution. If your integrity is in place, then the right people will know you are trying your best, including yourself. And, just for the record, my definition of integrity is doing what it right, even when no one is looking. Your inner voice is usually not to be ignored. If drama is your mode, then drama will follow you wherever you go. It means that you crave being in a crisis and will purposefully, even if subconsciously, set yourself up for this. Today I discovered a new vocabulary word that fits here perfectly: "shananigator" - noun - a person who instigates shananigans. I am wondering if this is the best way for us to all come together to solve problems. Probably, we want to skip the drama and leave it to the stage and screen. Sometimes that famous "box" gets in our way. You need to not think in the box. You need to not even think outside the "box." Looking at this in a positive manner is to just throw the damn "box" away and start embracing change. We really do not need to wait for permission to try new things. Instead of worrying about it, do something. My grandmother used to say that worrying is like a rocking chair. It will give you something to do, but it won't take you anywhere. One of the last things that we all need to work on is to start believing that taking care of ourselves is critical. You have to be well taken care of by yourself in order to even begin to help others. You are not being irresponsible in taking care of yourself, you are being practical. Remember the commercial, "Try it. You'll like it?" If you don't try, nothing will ever happen. We all are not out there to rule the world. What is needed is a coming together that we can agree to disagree, and to continue to respectfully listen to one another so that the best solutions to our problems can become unlocked.